15mm (after machining) Redwood T & G Shiplap. Planed interlocking T & G Board 15mm Thick after machining. CLADDING ADVICE WARNING - Please be aware that sizes given for the thickness of our claddings are after machining and what you will receive. This IS NOT always the case nor clear from other manufacturers or suppliers. As an upgrade to the standard Framing is the heavier duty 38mm x 63mm CLS framing. This framing is a planed rounded edged pressure treated timber which adds additional rigidity and compliments the smallest of building. All of our framing and claddings derive from mainly Sweden and Russia. All our our wood supplied to us comes from well established companies bearing the FSC and PEFC Trade Marks. Although our wood does carry the FSC or PEFC logo, we DO NOT hold chain of custody certification. Please beware of companies that carry the PEFC or FSC Logos on their websites, this DOES NOT mean they are audited to hold chain of custody. You can check and verify their status by visiting the FSC and PEFC websites. Depending on the size of building, type of building and where the door is positioned, (especially on the Pent Ranges), will determine how many windows as standard you will get in your shed. For Example: A 6 x 4 Kent Apex Shed will have 1 Window but a 10 x 8 Kent Apex will have 3 Windows. All windows are 2 x 2" Square and are fixed as standard. Opening windows can be purchased via the Optional Extras. 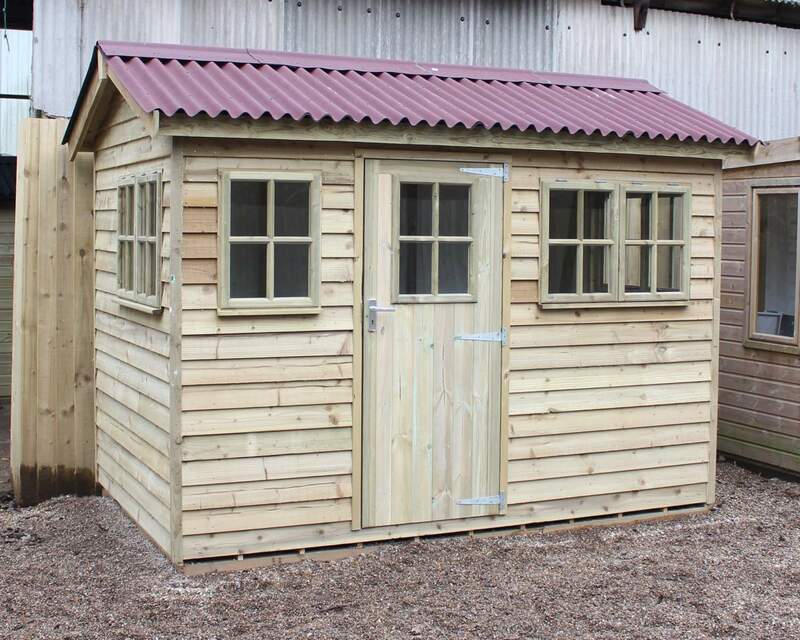 Some small sheds like the 6 x 4 Guildford or the 6 x 4 Essex Pent with the I Position Door configuration will get windows 18 x 24" or as is able to get into the space. Doors are normally 30" wide by 6ft High as Standard. 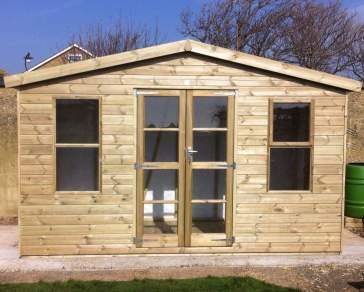 If you opt for a small shed like the 6 x 4 or 7 x5, you may get a 27" Door depending on the style you have chosen. If you choose a Pent with a E, F or J Configuration, the door will be slightly lower also to accommodate the roof overhang. 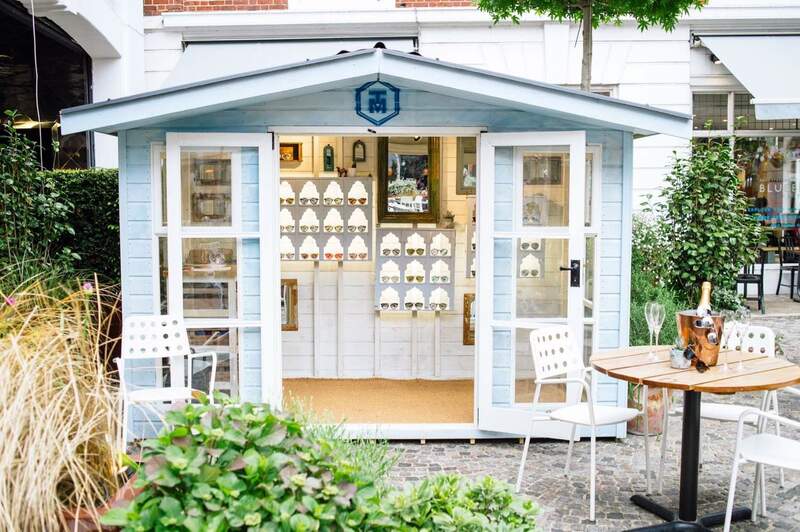 Our sheds, workshops and summerhouses (except for certain models) are priced to include a standard T&G Floor and Roof. T & G Roofs and Floors - made from 12mm T G V interlocking planed board. This method of treatment is well known for being the best type of treatment as the treatment used is forced into the wood giving it a long lasting defense against insect and fungal attack. To stop water penetration, we do advise the use of a solvent based treatment yearly to prevent this. PLEASE NOTE: Although all the pressure treated timber goes through the same treatment process, slight variations in colour can occur from board to board. This is a natural occurance and is in no way an imparement of the timber nor treatment. Still not sure of our quality? Send us your name and address and we will send you a free sample pack of the different types of timber we use.